Combine the lime juice, garlic, agave or sugar, and salt in a large bowl and whisk to blend. Keep whisking as you drizzle in the oil until it is completely incorporated; set aside. Place a colander on a plate next to the stove and have a pair of tongs or a spider skimmer handy. Combine the coconut milk and water in a medium saucepan and bring to a boil. Add the noodles and cook for exactly 3 minutes (best to use a timer). Use the skimmer or tongs to lift them out (leaving the pot on the heat) and transfer them to the colander. (They will be noticeably al dente.) Shake the colander over the plate to drain and dry the noodles, then transfer them directly to the marinade in the bowl. Turn and lift with tongs and/or a fork to get them coated. Return the colander to the plate (emptied of any water) near the stove. Add the green beans to the simmering water�? ?coconut milk mixture. Cook them for about 5 minutes, or until just tender. Use the skimmer or tongs to lift them into the colander to drain. You can save the coconut broth to make a little soup snack for yourself. Let the salad cool to room temperature, then add the cucumber and carrot. Cover and chill until serving time; the optimal marinating-chilling time is about 2 hours. 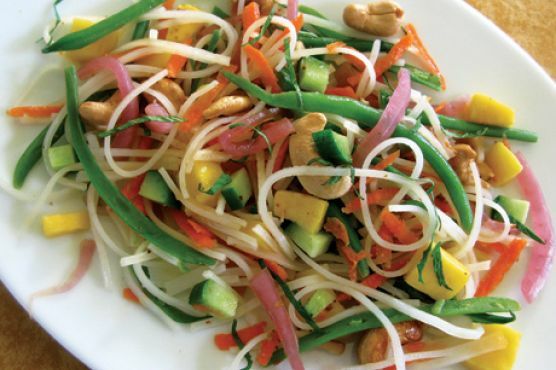 Stir in the mango, mint, and most of the cashews shortly before serving. Serve topped with the remaining cashews and any combination of the Enhancements. Don't discard any leftover coconut-graced cooking liquid. Instead, make it into a cook's snack by adding tiny touches of lime juice, sugar, salt, and garlic, and a torn basil leaf. Sip happily while finishing the recipe. Reprinted with permission from Heart of the Plate: Vegetarian Recipes for a New Generation by Mollie Katzen. Copyright © 2013 by Tante Malka; photographs and illustrations © 2013 by Tante Malka. Published by Houghton Mifflin Harcourt.